Hi, Mamas! T-minus TWENTY-NINE days until my bridal shower! I am SO excited! I’ll be having a destination wedding, so I don’t get to celebrate with many people at the actual ceremony. That means I’ll be milking the at-home celebrations as much as I can! We are having a bridal shower + wedding shower at work since we work for the same company and have a lot of the same frolleagues (friends that are also colleagues), and a reception here in Texas after the wedding. The bridal shower will only be a celebration for the ladies in my life: my mom and mother-in-law, sisters, aunts, cousins, and friends. This means it can be as girly and lovey-dovey as we want! I get to celebrate finding the love of my life and his incredible daughter with no holds barred! No shame in my game. My sister, aka Matron of Honor, is planning the most posh bash to celebrate my upcoming nuptials with all of the amazing ladies in my life! And I love excuses to craft for those parties! 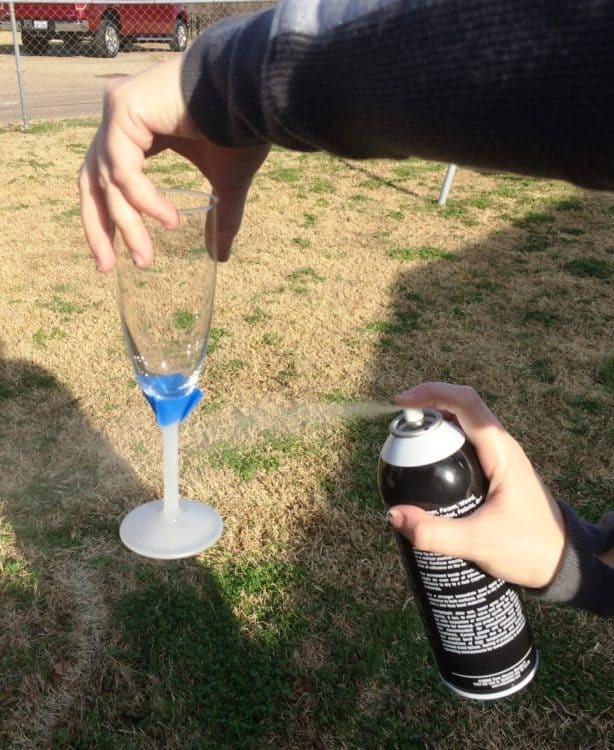 Enter: DIY Bridal Shower Glitter Champagne Flutes. As part of the brunch bridal shower she’s planning, my sister decided we just had to have a mimosa bar. Sounds divine, right? We’ll have a mix of juices, fruit garnishes, and champagne! 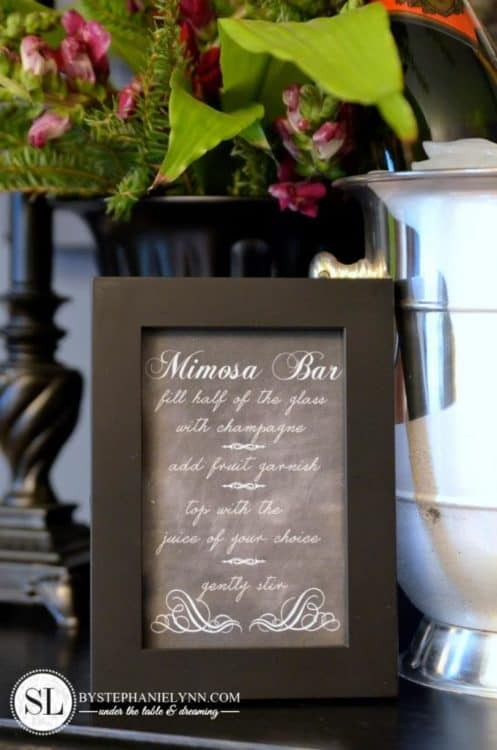 For tips on how to prepare a mimosa bar, I highly recommend this post on By Stephanie Lynn. I’ll keep you posted on how ours turns out! We decided that the classiest mimosa bar called for the classiest champagne flutes, obviously. Bonus points because they can double as shower favors! So we got to work trying to figure out exactly what we wanted. We quickly decided on a color scheme: pink and gold. So posh. Now, on to the decorating! My sister had some champagne flutes she had purchased years before when IKEA ran a New Year’s special, so we purchased a few more boxes and were ready to get to work! This actually is a super simple craft with classy, extravagant results. I couldn’t be happier with how they turned out! 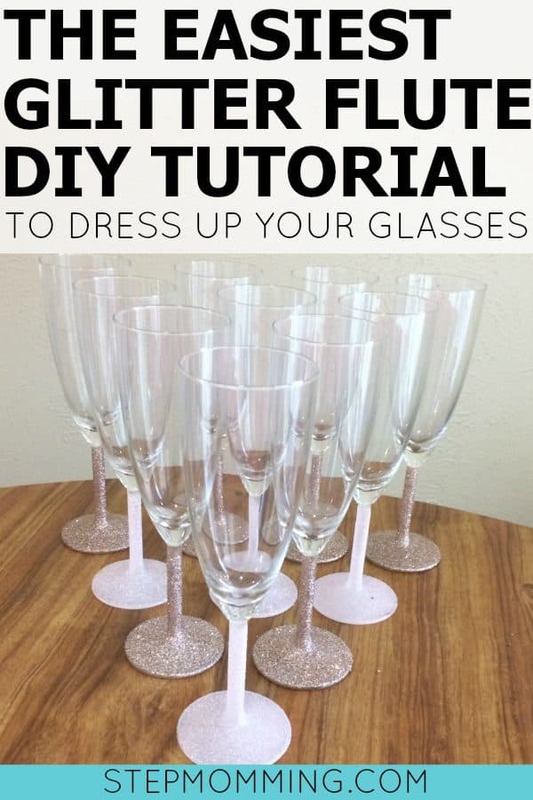 Just follow a few basic steps to get the bridal shower glitter champagne flutes of your dreams! #1. Put the paint tape just above the flute stem. You only need about 5 inches of painter’s tape to wrap completely around the stem. I folded mine several times to keep the tape straight all the way around. Once you start spraying the adhesive, you will want to keep it restricted to only the parts of the glass you actually want glittered! #2. Spray adhesive around the flute stem. I am a huge fan of spray adhesive! This method proved way easier and faster than using a sponge brush to apply adhesive to the stems. Though it required a little more time with the painter’s tape, spraying the adhesive took only a matter of seconds! The spray adhesive I used changed the glass to a foggier color so that it was apparent if I had missed a spot. 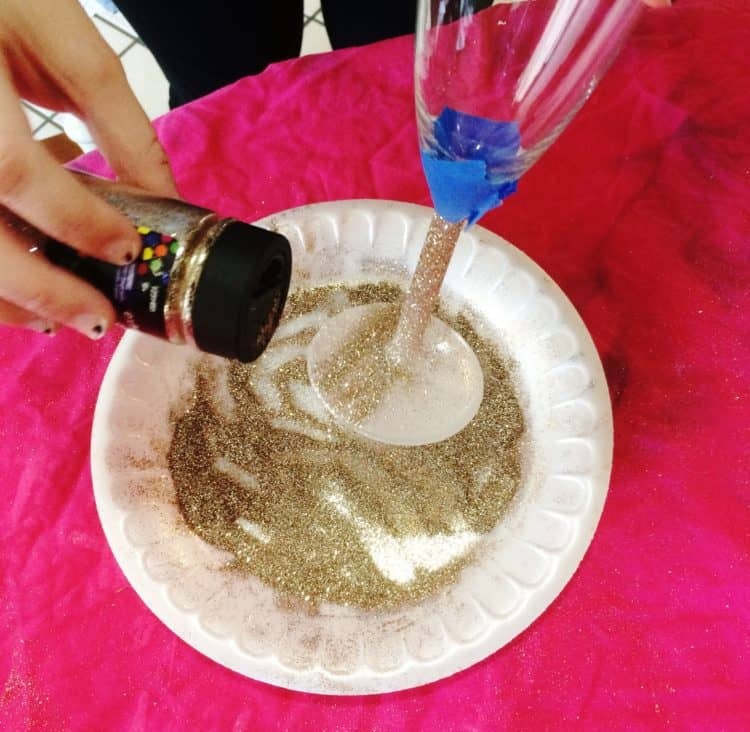 It helped me to ensure I was thorough and would completely coat the glass stem in glitter. #3. Sprinkle glitter on the sticky stem. Now that the stem has been properly sprayed with adhesive, it’s ready for the glitter! 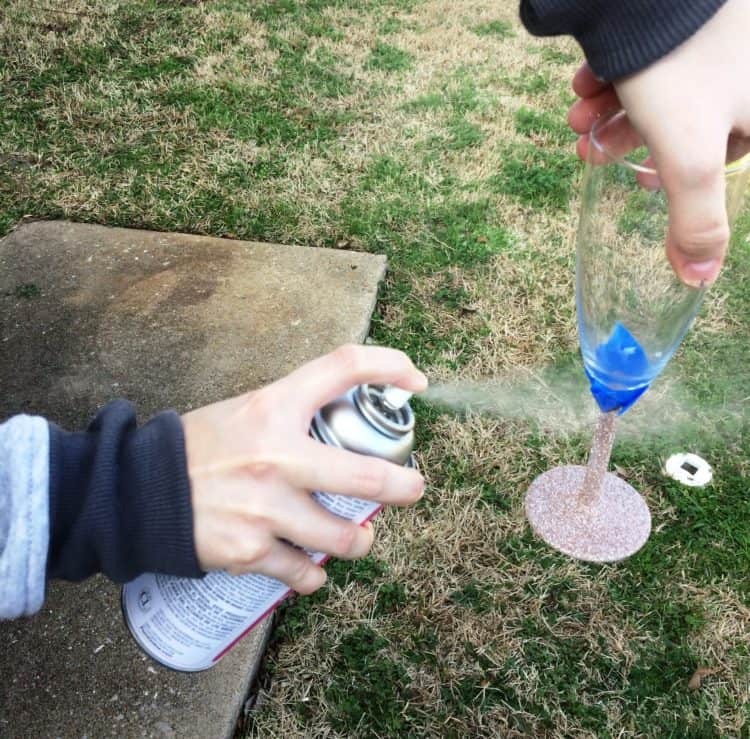 We alternated between gold glitter and light pink glitter when decorating the champagne flutes to fit our color scheme, but you can use any color you want! We ended with half of each color, and I just couldn’t decide which I liked better. I made sure to sprinkle the steps with glitter atop a paper plate so that I could gather the extra and repurpose it! I alternated between using my fingers to sprinkle the plate glitter onto the stems where I missed, and with the jar and funneling the plate glitter back into the original container. This way, there was barely any waste! Woohoo – glitter win! #4. Spray sealant on top of the flute stem. 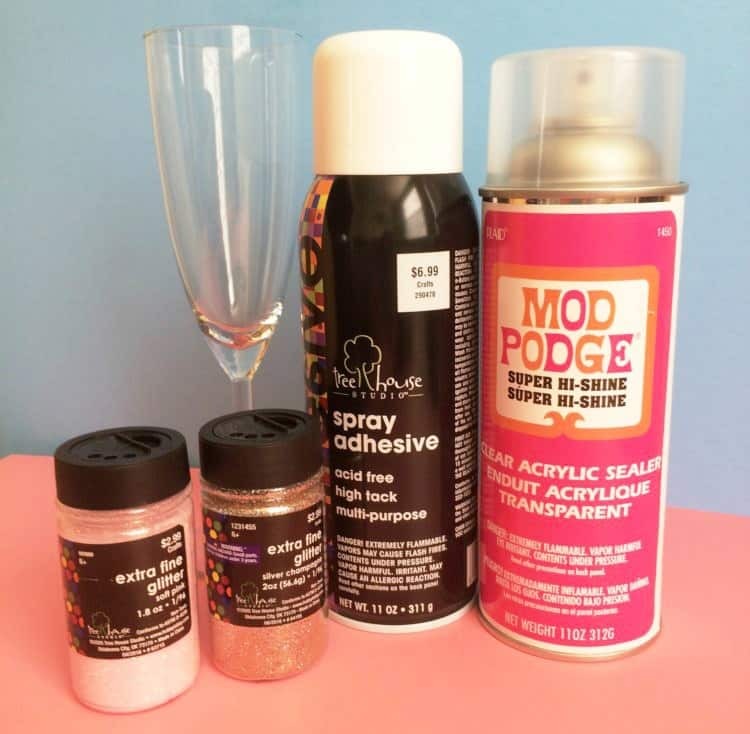 To keep the glitter from rubbing off or leaving splotches of glass without sparkles, we sealed the glass with a mod podge sealer. Again, I’m a huge fan of the spray can! Once the glitter stage was complete, it took only a few seconds to seal the glasses up! #5. Remove the tape and allow the sealant to dry. Now, unpeel that bright blue tape and voila! 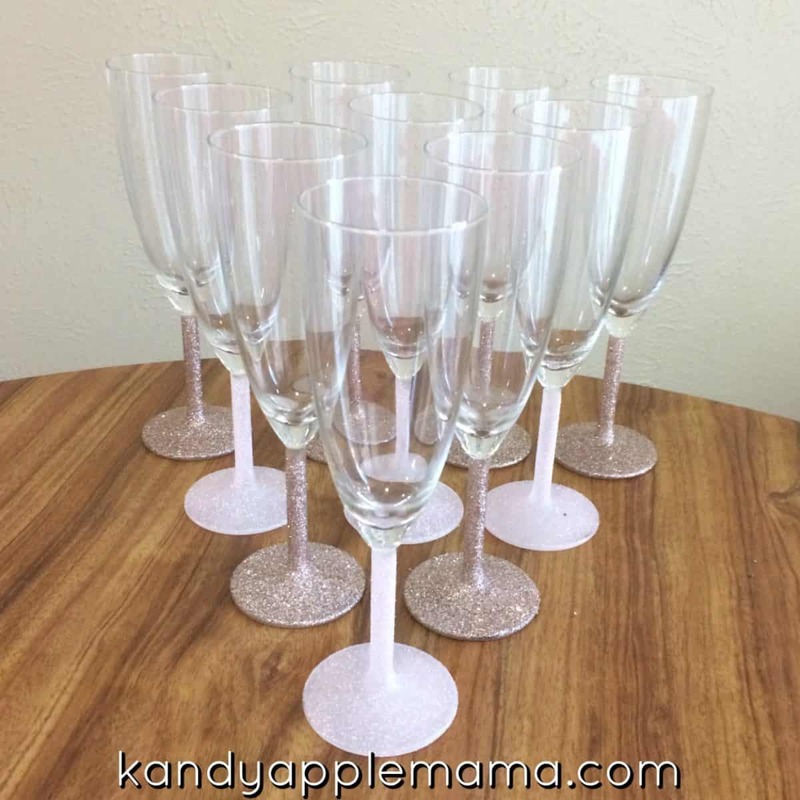 Your beautiful glittered champagne flutes are ready for your bridal shower, wedding reception, or any other sparkly purpose your heart desires! Seriously. How gorgeous are these?! AND how easy were they? I’m not someone who undertakes crafts with too many materials, steps, or complexity. 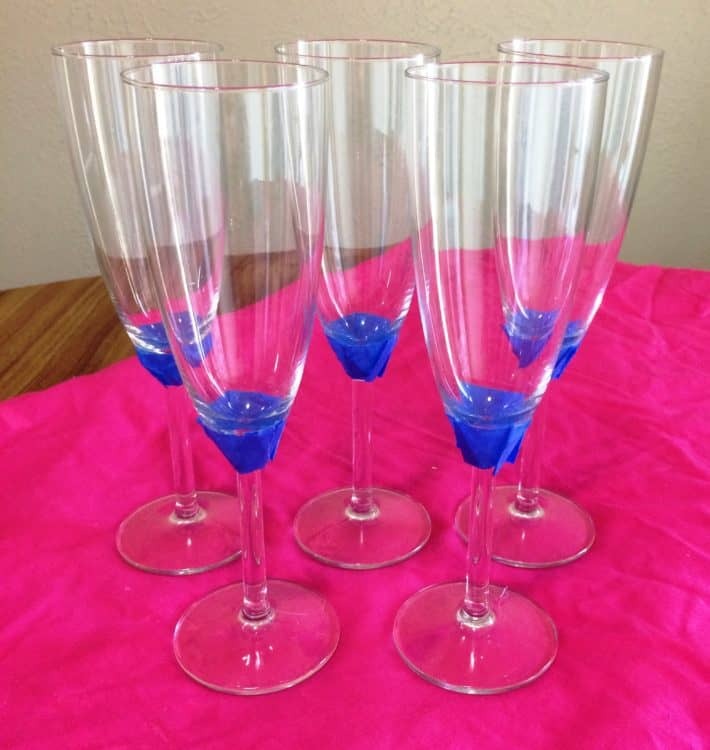 These wonderful DIY glittered champagne flutes were perfect for my patience threshold, skill level, and ultimately, my bridal shower! Hi, Samantha! I picked mine up at Hobby Lobby, but you can also get them at Amazon! Here’s the link for the adhesive: https://www.amazon.com/gp/product/B00178ORYY/ref=as_li_qf_sp_asin_il_tl?ie=UTF8&tag=kandyapplemam-20&camp=1789&creative=9325&linkCode=as2&creativeASIN=B00178ORYY&linkId=4ebc2fc72876a0c7ce95207429c24f1a and here’s the link for the sealer: https://www.amazon.com/gp/product/B003VYD9DM/ref=as_li_qf_sp_asin_il_tl?ie=UTF8&tag=kandyapplemam-20&camp=1789&creative=9325&linkCode=as2&creativeASIN=B003VYD9DM&linkId=19738e098791431794776fee6dd978ab. If you scroll up in the article, the items look pink in the list – that means they’re actually links, and you can click on them to go to the item’s listing on Amazon! 🙂 I hope that helps! Please let me know if you’d like any additional assistance. This is probably my favorite craft I’ve ever done! What a great idea to personalize your glasses Kristen!! Those are lovely! How fun!